Sorry, Dr Pepper, but this might be the most unfortunate, unintended instance of product placement ever. 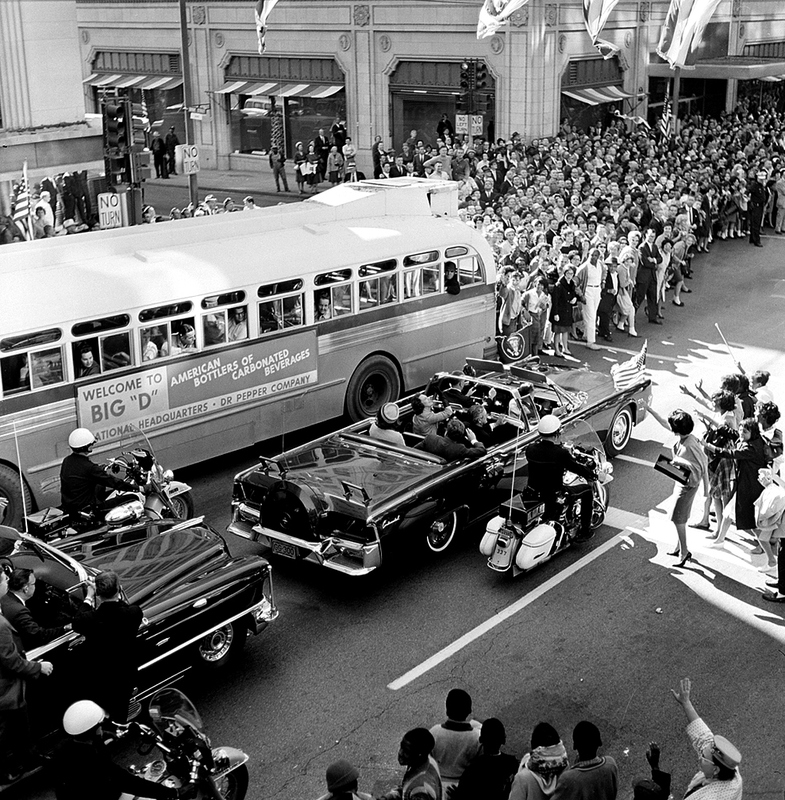 AP photo, November 22, 1963. The bus advertisement was actually to welcome the American Bottlers Association who were holding their annual meeting in Dallas, not for JFK. Former Vice President Richard Nixon who, ironically, was narrowly defeated by JFK in the presidential race three years earlier, attended the meeting in his role as attorney for Pepsi. Nixon departed Love Field just before Air Force One arrived and did not learn of the assassination until he had arrived home in New York. Also attending the bottlers meeting was movie star and Pepsi board member Joan Crawford, widow of Pepsi chairman Al Steele. And poor Dr Pepper caught in the crossfire (…as it were). My conspiracy theory knowledge is spotty, but the Nixon-in-Dallas connection was one of the many “interesting” things in Madeleine Duncan Brown’s book “Texas in the Morning,” which I read one day on a particularly slow day at a bookstore I owned. Talk about your bizarre pseudo-history, pseudo-romance novel (which Brown asserted was FACT!). I only hope that Joan Crawford appears in the Warren Commission Report!